Blending the past and present, Blackbeard’s Lodge boasts an Old World grace and charm in the heart of Ocracoke. 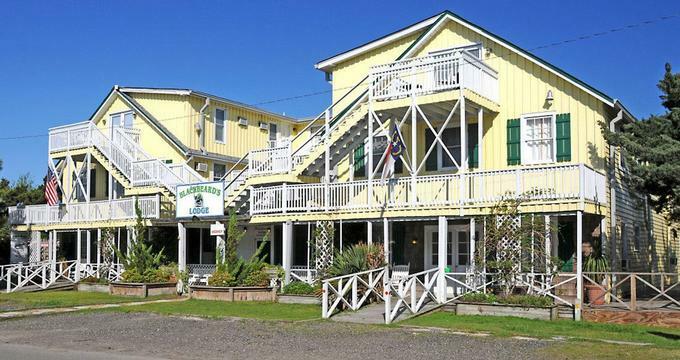 Located on the remote barrier island of Ocracoke, North Carolina Blackbeard’s Lodge features elegant accommodations in the form of guest rooms, luxury suites, and family apartments, top-notch facilities, including a lovely swimming pool, a well-equipped games room, and lush gardens. Established in 1936 as the Wahab Village Hotel, Blackbeard’s Lodge is the region’s most historic hotel and the oldest operating lodge on the Island. Beautifully restored to its former glory, the hotel, which once boasted a movie theater and a skating rink, is a popular choice for solo travelers, couples, and families to the island. 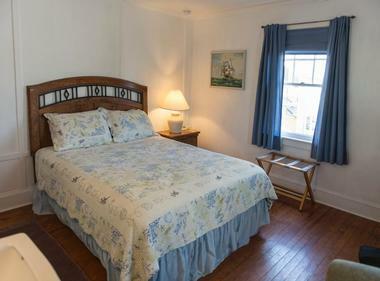 This quaint family-run inn is conveniently situated close to some of Ocracoke’s most beautiful beaches, the Silver Lake Harbor, and the historic Ocracoke Lighthouse, and is within walking distance to the village’s best restaurants, shops, and attractions. Blackbeard’s Lodge offers 36 well-appointed guest rooms, suites, and apartments, each of which is individually decorated and furnished to reflect its own character and charm. The pet-friendly accommodations offer comfortable, warm surroundings with historic charm and traditional southern hospitality and feature modern conveniences such as private bathrooms with showers and bathtubs, air-conditioning, coffee makers with gourmet coffee and teas, flat screen televisions with premium cable channels and complimentary wireless Internet throughout. Some rooms and suites feature king-size beds, fully equipped kitchens with utensils and appliances, jetted bathtubs in the bathroom and private balconies with stunning views. The Boyette Suite offers two separate sleeping areas with a queen-size bed and two twin beds, separated by a bathroom area with shower/bath combination. The suite also has a spacious sitting area with small refrigerator, two flat-screen televisions with premium cable channels, air-conditioning, coffee makers with gourmet coffee and teas, and complimentary wireless Internet. The North and South Apartments are perfect for families with pets and feature one queen, one double and one twin bed, with a queen-size pull out sofa in the sitting room and a dining table for six. A fully equipped kitchen has a microwave and coffee maker and is ideal for self-catering. Modern amenities include two flat-screen televisions with premium cable channels, air-conditioning, coffee makers with gourmet coffee and teas, and complimentary wireless Internet. The Manager’s Apartment offers added levels of luxury and space with three separate bedrooms, two bathrooms with showers and a Jacuzzi tub in the master, separate living and dining areas a dining table for six, comfortable sofas and a fully equipped kitchen. A private screened porch has tables and chairs and overlooks the swimming pool. Modern amenities include two flat-screen televisions with premium cable channels, air-conditioning, coffee makers with gourmet coffee and teas, and complimentary wireless Internet. Located on the third floor of the Lodge, the Wahab Suite, also known as the Presidential suite features a king-size bed and private en-suite bathroom with bathtub and shower, and a fully furnished living and dining area with six-person dining table, queen-size pullout sofa. A full kitchen has all the appliances, and utensils need for comfortable holiday living and a wet bar area has a microwave and coffee maker. A semi-private balcony boasts beautiful views over the village. 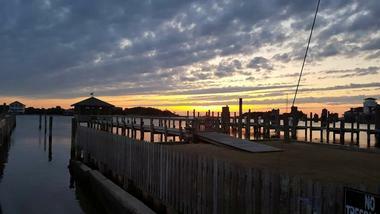 There are several excellent restaurants within walking distance of the Lodge in the town of Ocracoke. 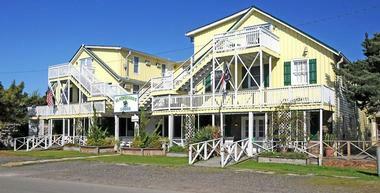 Blackbeard’s Lodge has lovely amenities that add to the relaxed ambiance of the cozy hotel. A sunny porch with tables and chairs offers a place to relax and soak up the beautiful garden views, while an elegant indoor lobby has a grand piano and wood-burning stove dating back to the 1800s for snuggling up in front of on cold winter nights. A swimming pool is surrounded by tall cedars and bicycles, and golf carts can be rented for exploring the area. An indoor games room has billiards, and foosball tables, an air hockey table, a games arcade and various board games and a free shuttle service are offered to the airport and harbor. Complimentary high-speed wireless Internet can be accessed throughout the property. The village of Ocracoke and the surrounding area offers a variety of attractions, activities and interesting things to see and do. Visit the oldest operating lighthouse in North Carolina, the Ocracoke Lighthouse and learn about the island’s maritime history; see the famous Ocracoke Wild Banker Ponies about five miles north of the village; and take a tour of the ghost town of Historic Portsmouth, once a former shipping center that was later deserted. Hike the Hammock Hills Nature Trail, which winds through several diverse ecosystems from salt marshes and dunes to low maritime forests and enjoy a range of water sports around the island, from sailing, clamming, kite-boarding and parasailing.